Thera Cane is a self massager used to apply pressure to sore muscles. The unique design of the Thera Cane lets you apply deep pressure massage to hard to reach areas of your body on your own. The Thera Cane uses two strategically placed projections and six treatment balls to help relieve pain. A gentle, manually applied massaging action is all that is required. The two longer rods can be used to provide leverage and an increased mechanical advantage when the Thera Cane is used on the neck or upper and lower back. The owner's manual illustrates a variety of ways to use the Thera Cane effectively over the entire body. For successful outcomes, one must have proper instruction. Though the owner's manual offers comprehensive illustrations for self-treatment, it is strongly recommended each user obtain a copy of the Thera Cane video. There is nothing like a video to show the user how to place their hands on the "Cane" while learning how to move it to achieve optimum results. Users can easily cue to the section of the video that is appropriate for their specific need, e.g., shoulders, back, legs, etc. How Does the TheraCane Work and Who is it for? Trigger points are tender spots that develop as a result of muscular injuries, strains, and trauma. When muscles, ligaments, and tendons become weakened, overstretched, or inflamed, tiny tears in the soft tissue can occur. As the tissue heals, it contracts, becoming twisted and knotted. These knotted fibers restrict the blood supply needed by the muscle. To protect itself from further injury, the muscle "learns" to avoid pain and guards against it by limiting the muscle's movement. If not treated effectively, a cycle of increasing pain, muscle spasms, and loss of function can occur and develop into a chronic condition. Pressure on a trigger point helps deactivate it, although the exact mechanism is not known. Most likely, the massaging effect performed using the "Cane" helps relax the knotted area, normalizing blood flow to the muscle. The Thera Cane can be used by anyone, anywhere, anytime they want to reduce pain and discomfort. A program of heat or ice, gentle stretching and exercise is often recommended in addition to use of the Thera Cane. Relieve Tense Muscles. Reduce Stress. Everyday. After A Workout. at a desk all day . Love it use it every day. Relieve Tense Muscles. Everyday. Reduce Stress. Beginning User. normal joe. sore neck & shoulders. 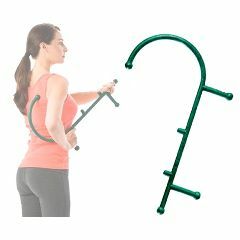 The Thera Cane is great for those hard to reach spots. I have been using mine specifically for the shoulder blade. Sturdy. Comfortable. Relaxing. Compact Design. No strength need. works in shower or tub. Works with NobCessory . Lasts forever. Trigger Point therapy. Easy to use. No shoulder rotation. Relieve Tense Muscles. Improves Circulation. Reduce Stress. Everyday. After A Workout. Apply Meds w/ Nobcessory. Use in shower/bath. Shoulderinjury. muscle spasm. Chronic Back Pain. Tension Headaches. sore neck & shoulders. at a desk all day . Past athlete. lupus. neuropathy. back pain. Thera Cane can be used easiest all over the body unlike the competition. I use it along with some other simple things at the same time, it is the easiest one to do that with. Relieve Tense Muscles. Improves Circulation. Beginning User. Shoulderinjury. Disabled Veteran. muscle spasm. pinched nerve L arm. Chronic Back Pain. sore neck & shoulders. I have not been able to turn my neck to the left for years and one use of the theracane relieved the tension that allowed me to have full range of motion. Because of neck issues I have used two pillows for sleeping for 4 years. Now I am back to one pillow and pain free in the neck region. Relieve Tense Muscles. Improves Circulation. Reduce Stress. Shoulderinjury. sore neck & shoulders. When I start getting the tension headaches, I find the trigger point in neck or back and rub it out with the Thera Cane. Always helps reduce or eliminate the headache. It is plastic composite. There is no odor to it, and its very sturdy. We have the same one for 12 years! Yes, it can be used to stretch the tendon gently, effective along with the standard exercise of using body weight with ball of foot on edge of stair to do same. Best to have PT show you how. This use of Theracane is not based on trigger point, but works. can i get a massage cane through a doctor or use my health care to get a discount some how? Your phone number is wrong. Could you put your right phone number on your Web site? I can help relieve the muscle spasms that sciatic pain causes. Have PT or Dr show you piriformis stretch--this actually helps the nerve pain. The order arrived on time. You have a very nice webiste, good service and a nice product. I will be using you akin and recommending you to my friends.